I will update this page whether we have puppies or not. ​All our puppies have been adopted at this time. - Click here - to go to the Home Page to fill out an application for a future litter. This is Misty, first time mother, but you'd never know it! ​Misty delivered 8 beautiful pups! Bailey is dad. Misty is my second youngest dog. Bailey is sable in colour. 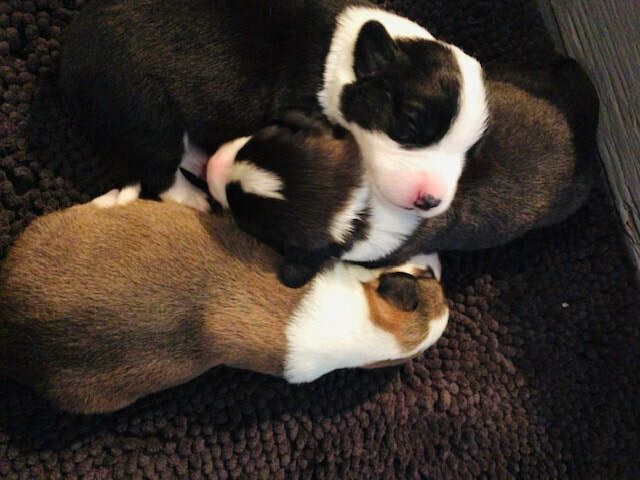 The puppies are brindle (one male, one female), black and white (two girls and a boy), 2 sables (one of each) and a tri-coloured female! Misty's puppies were all adopted March, 2019. The pups above are just under 2 weeks old. When the puppies turn 8 weeks old, they have learned and grown a lot. Their mother teaches them everything they need to know about being a dog in the world. They open their eyes for the first time and begin exploring their environment, they begin to eat kibble, and start potty training. Their mother teaches them about family life, living with other pets and siblings, and how to behave in the indoors and out. 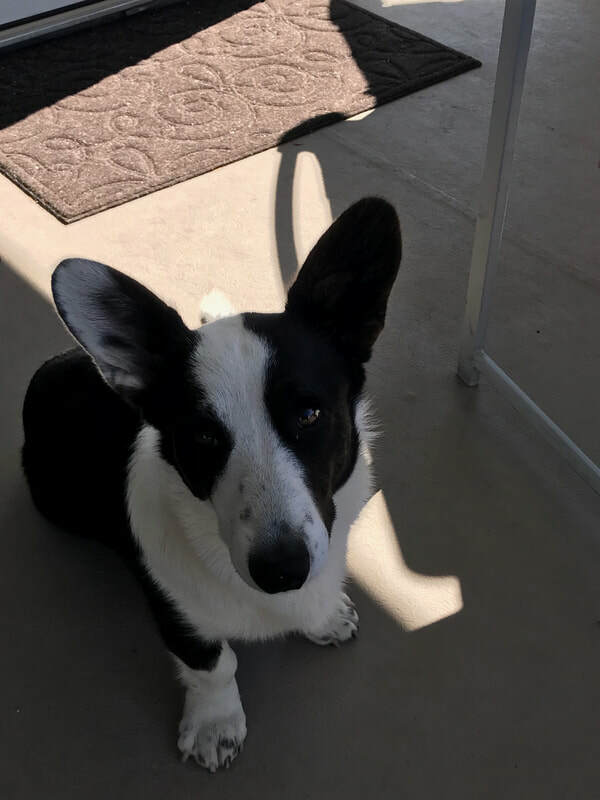 At 8 week old the pups are ready to graduate from their mother's care, to go on their biggest adventure ever - life with their new families - but at Corgiallyurs we don't say goodbye to our pups if we can help it, we are committed to all our dogs for their lifetime. On the next page Corgiallyurs Graduates we have pictures of our Corgi living their lives generously shared with us by their families. We can't get enough of these pups! The details: Our puppies are sold under a no breed contract. Shipping is available for an additional charge. Teilo and Kobe were from our very first litter. So hard to let them go... but my husband keeps reminding me "you can't keep them all." I know. Motherhood doesn't end on the adoption date for my girls. Riley is visiting her puppy. Run Riley, your puppy wants to play!